Yossi Gerson, a long time Lawrence resident left his home over Shemini Atzeres to visit a friend in Queens. 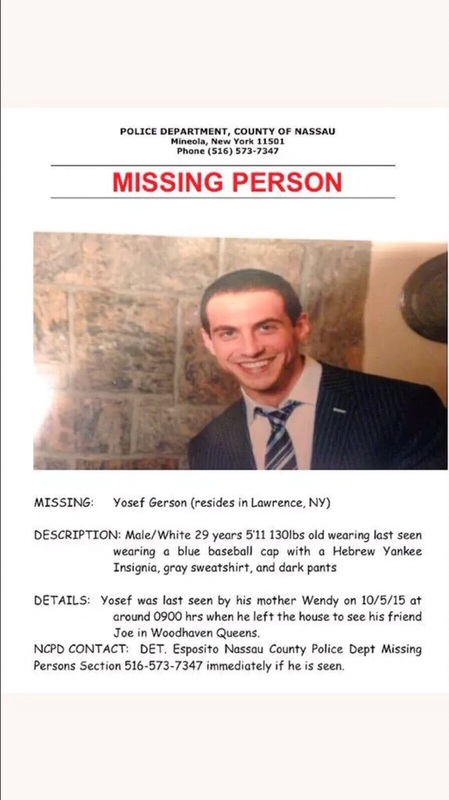 He was supposed to have returned home at the completion of Yom Tov but never did. Yossi is in desperate need of medical attention and we really need any and every possible lead as soon as possible. We apologize for utilizing this email list at this hour but we feel it is warranted in the hopes that someone receiving this message sees Yossi and notifies us. His Hebrew name is Yosef Yechiyeh ben Devorah. Thank you and Besuros Tovos.